They Won’t Be Bored This Summer: Kids Cooking Made Easy + Giveaway! Scroll down to the end of the post for instructions on entering a giveaway for a free copy of Kids Cooking Made Easy! This summer, keep your kids busy in an educational and fun way: introduce them to the kitchen! My mother always said that hungry children are cranky children. Bored, hungry, cranky…these are the less exciting aspects of having children on vacation for three months. But we have a solution: introduce the kids to the joys of cooking with Kids Cooking Made Easy! There’s a great educational aspect to cooking and following a recipe. As explained by the authors, Leah Schapira and Victoria Dwek. “Kids Cooking Made Easy is a picky eater solution,” says Victoria Dwek. “Kids either become more open-minded when they see how something is prepared, or they learn to prepare their own favorites.” Aside from kitchen skills, learning to cook has hidden educational benefits. As Leah Schapira points out, “Children learn about math and fractions when following a recipe.” They also learn to read and follow instructions – all while having a good time! Chock full of exciting summer recipes such as Teriyaki Beef Sticks, Peach and Mango Salad and Creamsicle Sorbet and fun crafts and edible activities such as Edible Sand Art and Homemade Button Candy, this book will be a delight for your children and a lifesaver (or at least sanity saver!) for you. Click here to purchase Kids Cooking Made Easy. Here’s a sample recipe for you and your kids to enjoy. 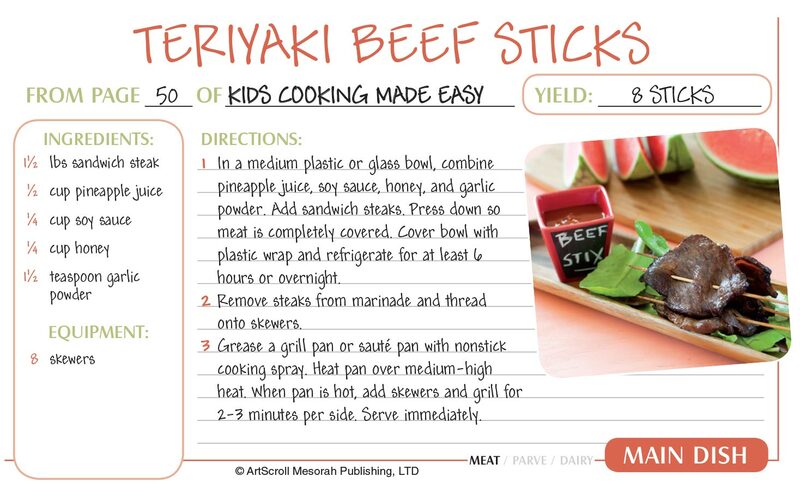 Make sure to scroll past the recipe for a chance to win a copy of Kids Cooking Made Easy! Comment on this post telling us: What is the first dish you remember cooking? **Giveaway ends on Friday, July 11th at 11:00 am eastern time. Winner will receive one copy of Kids Cooking Made Easy. Prize can be shipped within the USA. Winner will be notified via email. Valid email address must be provided to claim prize. Limit one entry per person. Would love to win this cookbook. Looks like very good recipes. I don’t know what the first thing I successfully made was, but I remember TRYING to make matzah balls and failing miserably. I remember making tuna and eggs. I tried baking a cake for my mother’s birthday as a surprise. I am sure the mess was a great surprise! I baked with My mom all the time but Scrambled Eggs was the first thing i did no my own!!! Pasta was the first thing I learned to make and I love making pizza from scratch and love to bake! Scrambled eggs in the microwave – ewwww!! Cake. I would always help mixing it! The first thing I remember baking was called “snowball cookies”. These were delicious crunchy cookies rolled in powdered sugar. Yum!